The voice of young London Reprezent 107.3 FM are our resident DJ’s for 2018. Including a DJ line up curated by ALPHABEATS. Listen out for future sounds from Complexion, Maxwell & Brother Portrait, Morenight and Yozu. Join a ‘storytelling’ themed plate painting workshop with Illustrator Eliza Hopewell. Referencing how Greek myths and legends were displayed on plates and pottery. Join Tate’s Library and Archive team for a collage workshop inspired by David Robilliard’s short and witty poems that add a humorous twist to the stories of everyday life. Story telling goes hand in hand with stand-up comedy, so come and join renowned comedy tutor Logan Murray to unlock your hidden comedian. Tate Britain was built on the site of the notorious Milbank Prison. Join this immersive theatrical experience unlocking stories from various archives, created by Elizabeth Jankowski and Francesca Scott. Join interdisciplinary performing artist Akeim Toussaint Buck as we go down a rabbit hole of sonic story-telling and the moving body. Join London based actress and playwright Yolanda Mercy and writer Angela Wereko-Anderson on the front lawn for a immersive storytelling intervention in the recently installed community garden project A Common Ground. 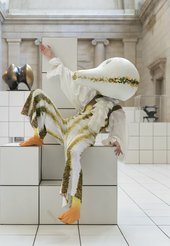 Anthea Hamilton will be in discussion with several the performers from The Squash, a project that has captured the imaginations of Tate Britain’s audiences. Paula Rego is well known for her paintings and prints based on storybooks. Discover one of great resources at Tate Britain and have an intimate experience with Rego’s visual storytelling. Join as we explore live art, food, dance, and the work of Anthea Hamilton in the library collections. Material selected by Katie Blackford and Holly Callaghan. This event has been programmed by young people aged 16–25 from our Tate Collective team. 16–25? Want 20% off food and drink?